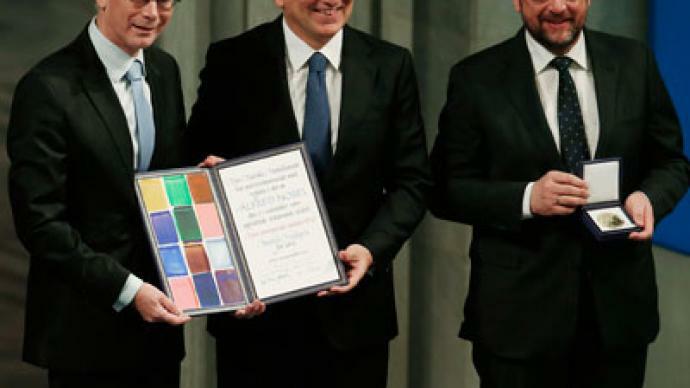 The European Union's presidents have received this year's Nobel Peace Prize on behalf of the 27-member group. However, growing numbers of critics have pointed to the EU’s economic and foreign policy failures, arguing the prize is undeserved. ­European Commission President Jose Manuel Barroso, European Council President Herman Van Rompuy and President of the European Parliament Martin Schulz have accepted the 930,000-euro ($1.2 million) award on behalf of the EU. In his acceptance speech, Van Rompuy praised postwar leaders in France and Germany who created the EU by uniting their economic interests: “The EU's secret weapon – an unrivalled way of binding our interests so tightly that war becomes impossible." The French and German representatives at the ceremony – President Francois Hollande and Chancellor Angela Merkel, respectively – greeted the award with standing ovations. But critics argued the award was an inappropriate honor. Six EU leaders, including British Prime Minister David Cameron, did not attend the event. The initial news that the European Union won the 2012 Peace Prize sparked heated debate over whether the award was being discredited, a debate that also raged after US President Barack Obama’s win in 2009. The Peace Prize win comes amid Europe’s worst financial crisis in decades, as well as numerous accusations of supporting large-scale conflicts abroad. The 27-member union has been frequently criticized for supporting regime change in foreign countries; several member-states have supported violent crackdowns on anti-government demonstrators. But Norway’s Nobel Committee looked beyond Europe's recent economic woes, unemployment and debt, honoring its decades of stability and democracy after the horrors of two world wars. “It seems like they got the prize because there hasn't been a war in Europe for many decades, rather then they did anything in particular,” Troika chief strategist Chris Weafer told RT. 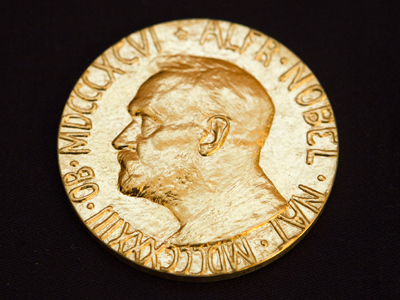 Previous Nobel Peace Prize winners have said the EU was unlawfully awarded the prize. 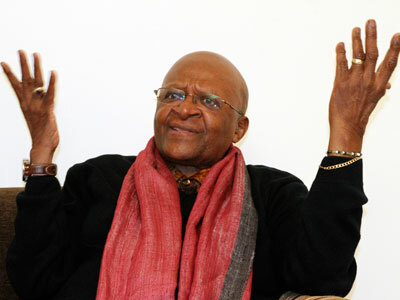 Archbishop Desmond Tutu of South Africa and two other Nobel Peace winners earlier wrote to the foundation to protest the decision to award the 2012 prize to the EU. Business professor and an independent investment fund manager Max Otte told RT that in his opinion, the EU's policies have brought disorder, not peace. Oslo residents held a protest on Sunday night over the award. Demonstrators denounced EU arms sales to conflict zones, the lack of aid to refugees and the social turmoil triggered by the eurozone financial crisis. During his acceptance speech, Barroso stressed that the prize was not only awarded to EU institutions and member-states, but also to the EU’s 500 million citizens. Users on Twitter and other social networks quickly pounced on this remark, arguing that all Europeans should therefore share in the prize money – which would work out to around 0.2 cents each. Nobel Peace Prize today awarded to the European Union: Population ~503m, award money ~$1.2m. Congrats Eurozone, that's 0.2 US Cents each.